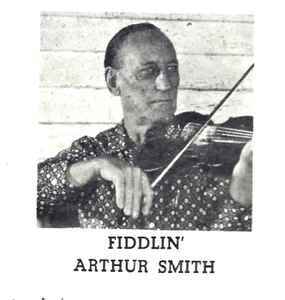 Fiddlin' Arthur Smith (April 10, 1898 - February 28, 1971) was a country and bluegrass fiddler from Tennessee. He took the nickname "Fiddlin'" and "The Original Arthur Smith" so that he wouldn't be confused with the younger Arthur "Guitar Boogie" Smith [Arthur Smith (2)]. On December 23, 1927 Smith made a solo debut at the Grand Ole Opry. In the 30s he formed The Dixieliners (AKA Arthur Smith & His Dixieliners and The Original Arthur Smith and His Dixieliners) with his daughter Lavonne and The McGee Brothers. In 1939 he briefly joined the Tennessee Valley Boys only to leave the next year to briefly join The Shelton Brothers before leaving to form a band called The Band of Arthurs, featuring men all named Arthur and his daughter Lavonne. More than five sessions were cut with the Delmores, the tracks coming out under the name of the Arthur Smith Trio rather than the Dixieliners, although later album reissues on County reverted back to the Dixieliners name. During the 1940s Smith was part of the Bailes Brothers, published two songbooks called Songs From the Hills of Tennessee and Arthur Smith's Original Song Folio no. 1 and briefly acted in western films. Arthur retired in the late 40s but had a comeback in the mid 50s and continued to play until his last show in 1969.